At least 33 are dead and 130 injured after a gang of knife-wielding men attacked a train station full of travelers in Kunming, China. Regular readers of this blog know that there is an astrological formula for mass murder, and will not be surprised to see that this event adheres to the formula. 1. Pallas sesquiquadrate Pluto: ethics corrupted. 2. Venus novile Neptune: perception of value diluted. 3. Pluto conjunct Venus and septile her ruler Saturn: value destroyed. 4. Pluto at IC: death plus (human) family / land. 5. Sun sextile Pluto: death in the spotlight. 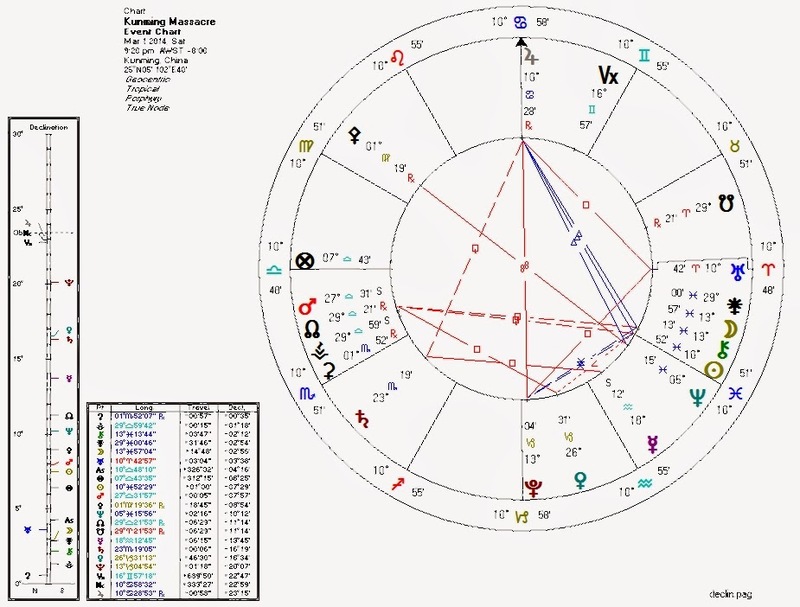 Jupiter in Cancer the MC provides a hint that the attack may have been racially/culturally motivated, as authorities claim. Astrology is often not a very scientific discipline, and is often subject to the whims and biases of the astrologer. The effect of Pallas-related configurations, however, seems to be quite measurable. When Pallas or her sign ruler aspects Pluto, is blocked by a discordant aspect from Jupiter, or is drained by the South Node, we often see humankind at its worst.